When cured, #800 Elastic Cement forms a tough, flexible, elastic membrane that can withstand greater stress than ordinary plastic roof cement, flashing compound or even modified plastic cement. #800 Elastic Cement is a heavy bodied compound that can be brushed or troweled (brush application is recommended). When making repairs to splits, seams or flashings that may be subject to a great deal of flexing or movement #800 Elastic Cement should be reinforced with polyester fabric. For best results and longest life #800 Elastic Cement should be coated with Elastahyde White Elastomeric Reflective Coating. #800 Elastic Cement is non-flammable, low odor and contains no asbestos fibers. #800 Elastic Cement is water based and can be applied to most clean (dust and oil free) surfaces. #800 Elastic Cement has excellent adhesion to most substrates including asphalt emulsion, wood, metal and masonry without the use of special primers. New, glazed asphalt roofs should be surface primed with #970 Primer. It can be applied to dry or damp surfaces using brushes or trowels. #800 Elastic Cement can be coated in 1 to 2 hours. If you need assistance with the application of this product call Western Colloid. 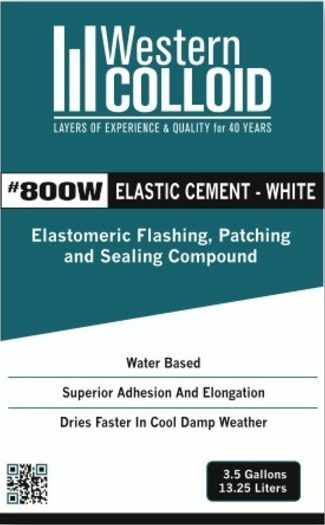 Western Colloid’s #800 Elastic Cement is a water based, elastomeric flashing, patching and sealing compound. It is formulated with premium acrylic rubber resins, inert mineral pigments and non-asbestos fibers to form a permanently elastomeric water-proofing and sealing compound. #800 Elastic Cement is available in white (#800W) or black (#800B). Black speeds the drying time in cold weather. For long lasting repairs to roofs, sheet metal, concree, mobile homes and air conditioning ducts. A surface flashing compound for new cold process, Glas-Shield or mineral surfaced composition built-up roofing. Repair cracks in masonry, stucco or parapet walls. Repair and seal mobile home, trailer and recreational vehicle roofs. Seal seams, flashings and screws on metal roofs. Repair expansion joints in concrete walls. Repair and seal air conditioning ducts, sheet metal gutters, metal coping and wall caps. Same as #800W except black in color. Dries faster in cool & cloudy weather. Used for prep and flashing on cold process systems that are to be top-coated.